American winged rocketplane. 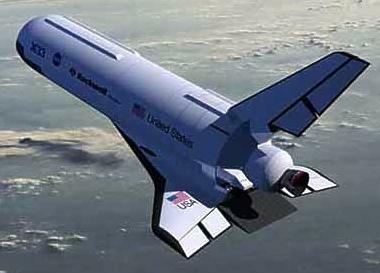 NASA-sponsored suborbital unmanned prototype for a single-stage-to-orbit rocketplane. 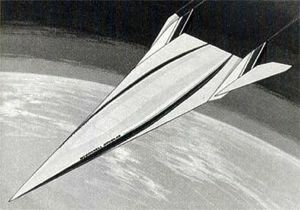 The Lockheed Martin vehicle would have used a linear aerospike engine, metallic insulation, and other features similar to their Starclipper shuttle proposal of 1971. In 1999 catastrophic failure of the composite fuel tank during static test brought into question the technical feasibility of the design. The program was cancelled in 2001 before any flight articles were completed and after over $1.2 billion had been expended. Status: Cancelled 2001. Thrust: 1,823.00 kN (409,826 lbf). Gross mass: 123,800 kg (272,900 lb). Unfuelled mass: 28,600 kg (63,000 lb). Specific impulse: 439 s. Specific impulse sea level: 339 s. Burn time: 886 s. Height: 20.40 m (66.90 ft). Diameter: 20.70 m (67.90 ft). Span: 20.70 m (67.90 ft). 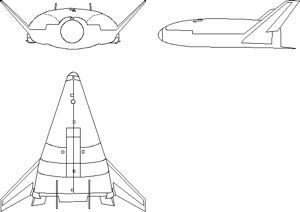 Rockwell International's Space Division, which proposed a vertical takeoff / horizontal landing delta-winged, twin tail, vehicle with five engines. 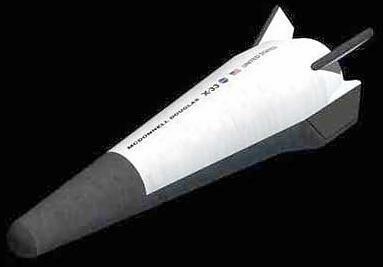 Rockwell's proposed half-scale technology demonstrator could not reach orbit. Rockwell's team included its Rocketdyne Division (propulsion); Northrop Grumman (composite airframe structures); Federal Express (operations planning/requirements); and Orbital Sciences (commercial planning). McDonnell Douglas, teamed with Boeing, proposed a vertical takeoff / vertical landing derivative of its existing DC-X and DC-XA technology demonstrators. However it also prepared a vertical takeoff / horizontal landing version in accordance with NASA's wishes. Lockheed, by then Lockheed Martin Corporation, was selected. By 5 March 1999 airframe components had been fabricated, engine stand tests were under way, structural tests had begun, and NASA dedicated the $32 million, 30-acre X-33 Flight Operations Center at Edwards Air Force Base. The center was designed the X-33 to be serviced and launched from that single location with a ground crew of fewer than 50 people. 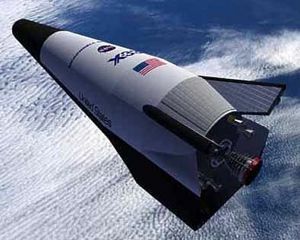 Two seven-day turnarounds and one two-day turnaround was planned to be demonstrated during the X-33 flight test series. Using composite materials to reduce vehicle weight was considered one of the keys to successfully developing a single-stage-to-orbit vehicle. In November 1999 the X-33's composite liquid hydrogen fuel tank failed during testing. An investigation into the cause of the failure revealed that composite technology was not mature enough for such use in cryogenic reusable tanks. Lockheed Martin proposed to complete development of the X-33 by replacing its two composite liquid hydrogen tanks with aluminum tanks. 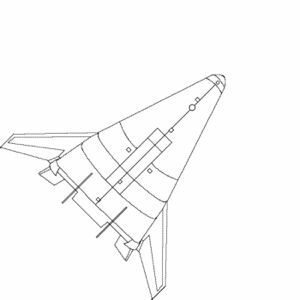 But NASA decided that the benefits of testing the X-33 in suborbital flight without proving the critical composite technology did not justify the cost. NASA investment in the X-33 program totaled $912 million. Lockheed Martin originally committed to invest $212 million in the X-33, and during the life of the program increased that amount to $357 million. For that money NASA and Lockheed Martin essentially proved that rocket-powered / vertical-takeoff / horizontal-landing single-stage-to-orbit vehicles were not feasible using existing technology. The result essentially killed further consideration of single-stage-to-orbit designs in America, Europe, and China for decades to come. Stage 1. 1 x X-33. Gross Mass: 123,800 kg (272,900 lb). Empty Mass: 28,600 kg (63,000 lb). Thrust (vac): 2,284.000 kN (513,463 lbf). Isp: 439 sec. Burn time: 886 sec. Isp(sl): 339 sec. Diameter: 20.70 m (67.90 ft). Span: 20.70 m (67.90 ft). Length: 20.40 m (66.90 ft). Propellants: Lox/LH2. No Engines: 2. Engine: XRS-2200. Status: Development 2002. Family: Rocketplane, Winged. Country: USA. Engines: XRS-2200, RS-2200. Agency: Lockheed.